Colorado's Cloud Nine Alpine Bistro welcomes guests with pretty glass mugs of this steaming wine, garnished with a slice of blood orange when it's in season. 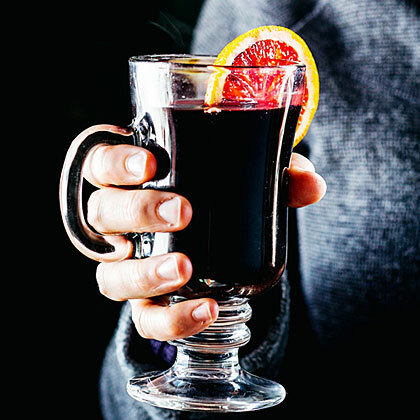 Since glühwein (German for "glow wine") is heated and infused with spices, don't bother with your best bottle to make it; just choose a red wine you wouldn't mind drinking. Pour wine into a medium pot. Add cloves, star anise, cinnamon, and juniper berries. Bring mixture to a gentle simmer over low heat (don't let it boil--high heat damages the flavor). Meanwhile, wash oranges (don't peel) and cut into 1/4-in. slices. Reserve 6 of the biggest slices and put remaining slices in with wine. Add brown sugar and stir until dissolved. Simmer wine mixture 10 minutes. Strain into an insulated container or ladle into mugs, leaving behind spices and oranges. Garnish each serving with a reserved orange slice. Make ahead: Up to 2 days, chilled (strain out spices before chilling; otherwise, they'll turn bitter). Reheat over low heat (you don't want it to boil).